achieved through seamless integration with legacy systems and back-end processes. Why consider a mobile BPMS? Fact-based decisions Business users are connected around the clock on any device they choose. This provides them with a centralized view of their processes when they need it, empowering good decisions without the restrictions of the office. Cost savings Working on processes on any device of the employees' choice significantly reduces hardware and support costs. The code-free widgets allow non-IT users to create and enhance their own process applications to adapt quickly to changing market dynamics. productivity Applications display optimally on any device, allowing users to access documents and reports via their smartphone and enjoy working on them. Optimized customer experience Adding mobility to BPM extends its role from seamless back-office automation to optimizing user journey right through the whole application. Bizagi delivers fast results that run optimally on every mobile device. Our innovative UI supports new devices as they come to the market. by the user community while maintaining compatibility. Mobile-first intuitive User Interface (UI) In Bizagi there is no such thing as a 'mobile form', only a single user interface that you design. The complete palette of interface Widgets are available for any device – including multi-page grids and data tables. Context-aware Widgets are intelligent, meaning they know how best to render on every device but can also take advantage of device-specific features - such as a camera or location services like Google maps. Device agnostic Bizagi mobile BPM users don't have to worry whether their device supports the software. Even the most complex BPM scenarios can now be handled by end users regardless of whether it's a notebook, tablet or smartphone; running BlackBerry, Android or Apple. 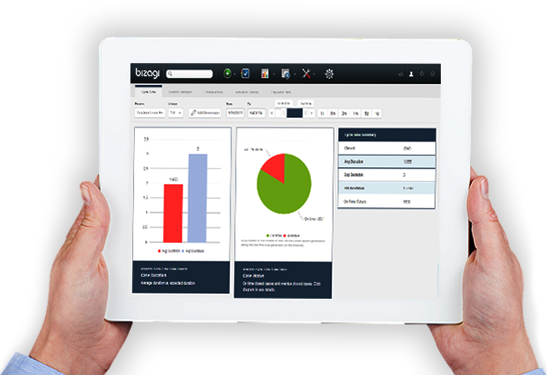 Flexible & extensible With the extensibility of the Bizagi Widget platform, customers can easily add new forms across multiple devices. What's more, our Widget Xchange offers a wide collection of complex UI building blocks to help you speed up your development and that of your colleagues.